Make yourself at home in one of the 27 air-conditioned rooms featuring kitchens with full-sized refrigerators/freezers and stovetops. Rooms have private balconies. Complimentary wireless Internet access keeps you connected, and flat-screen televisions are provided for your entertainment. Conveniences include complimentary bottled water and ceiling fans, and housekeeping is provided weekly. Featured amenities include limo/town car service, a 24-hour front desk, and multilingual staff. Guests may use a cruise ship terminal shuttle for a surcharge, and free self parking is available onsite. Satisfy your appetite with international cuisine at EL TAINO, one of the property's 6 restaurants. Relax with a refreshing drink at the beach bar, the poolside bar, or one of 5 bars/lounges. A complimentary buffet breakfast is included. Enjoy international cuisine at Tracadero, a restaurant which features a bar, or stay in and take advantage of the room service (during limited hours). Cooked-to-order breakfasts are available daily from 8:30 AM to 11 AM for a fee. Featured amenities include a business center, dry cleaning/laundry services, and multilingual staff. Event facilities at this property consist of a conference center and a meeting room. Relax at the full-service spa, where you can enjoy massages. You're sure to appreciate the recreational amenities, which include 2 outdoor swimming pools and a fitness center. This villa also features complimentary wireless Internet access, concierge services, and gift shops/newsstands. Located in San Rafael del Yuma, Viva Wyndham Dominicus Palace Resort - All Inclusive is on the waterfront, a 3-minute drive from Dominicus Beach and 11 minutes from Bayahibe Beach. 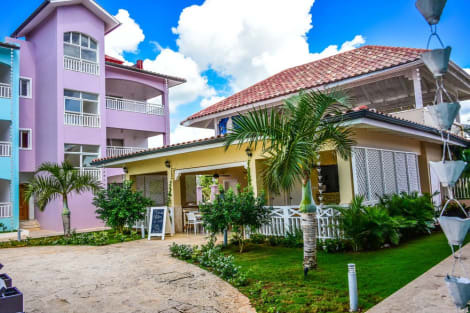 This all-inclusive property is 16.8 mi (27 km) from La Romana Port and 3.1 mi (5.1 km) from Monumento Natural Punta Bayahibe. Don't miss out on the many recreational opportunities, including a health club, an outdoor pool, and a waterslide. This property also features wireless Internet access (surcharge), an arcade/game room, and gift shops/newsstands. Hilton La Romana, an All-Inclusive Family Resort is ideally situated on the southeast coast of the Dominican Republic on pristine, palm-fringed Bayahibe Beach. Enjoy a picturesque setting and a wealth of amenities and services, all included in your stay. Located just 45 minutes from Punta Cana, we are near four championship golf courses, Saona Island, Catalina Island and Altos de Chavón.Whether you’re looking for adventure or just pure relaxation, we’ve got you covered. Enjoy a variety of water activities from windsurfing to snorkeling or just cool off in one of our 4 pools. Lounge poolside with a cool beverage or escape to the spa for a massage while the kids check out the Explorer’s Club for Kids or Core Zone Teens’ Club.Our spacious guest rooms feature a furnished balcony or terrace, mini-bar restocked daily, unlimited WiFi, and much more. Upgrade to a suite for a separate living area, powder room and plunge pool.Be prepared to feast. We offer 5 restaurants serving everything from gourmet international cuisine and grilled specialties to hearty buffets and grab-and-go selections.Our stunning location makes for spectacular events. Choose from 8,000 sq. ft. of state-of-the-art event space including 8 flexible meeting rooms, a Ballroom and two wedding gazebos. Celebrate poolside, on the beach or at the pier as well. Hotel Bayahibe is located 5 minutes’ walk from the Bayahibe water springs and 1 km from Bayahibe Beach. It features free Wi-Fi in public areas and a lounge area with wooden ceiling. The air-conditioned rooms have minimal-style décor, telephone, fridge and TV. The bathrooms are private and come with shower. Doña Clara Restaurant serves daily breakfast and dinner, and offers panoramic views. There is an extensive menu with seafood and specialized dishes. Hotel Bayahibe also has laundry service and can arrange tours to Saona Island, 20 minutes’ boat ride away. Altos de Chavon Mediterranean Village is 30 minutes’ drive away and La Romana Town Centre is 25 km away. La Romana International Airport is 15 minutes’ drive from Hotel Bayahibe. lastminute.com has a fantastic range of hotels in Bayahibe, with everything from cheap hotels to luxurious five star accommodation available. We like to live up to our last minute name so remember you can book any one of our excellent Bayahibe hotels up until midnight and stay the same night.